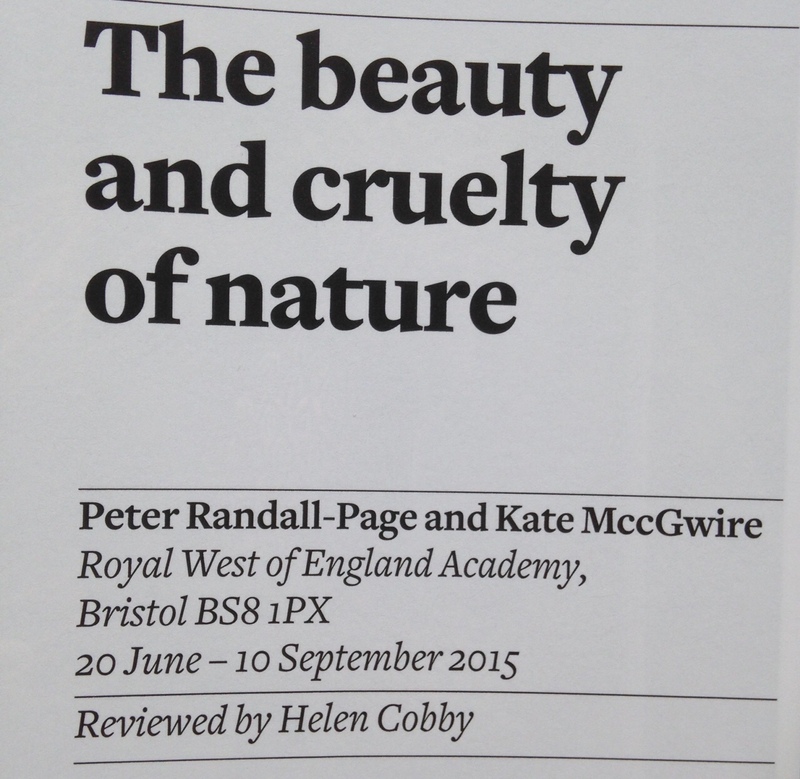 International artists Peter Randall-Page and Kate MccGwire have a wonderful joint exhibition at the Royal West of England Academy (RWA). 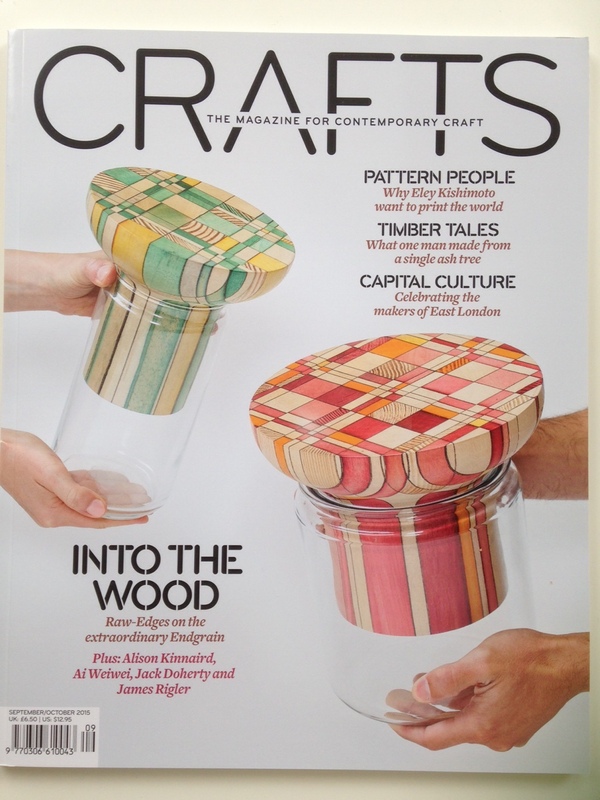 I was very pleased to write a review of it for the Craft Council’s ‘Crafts’ magazine, issue September/October 2015. 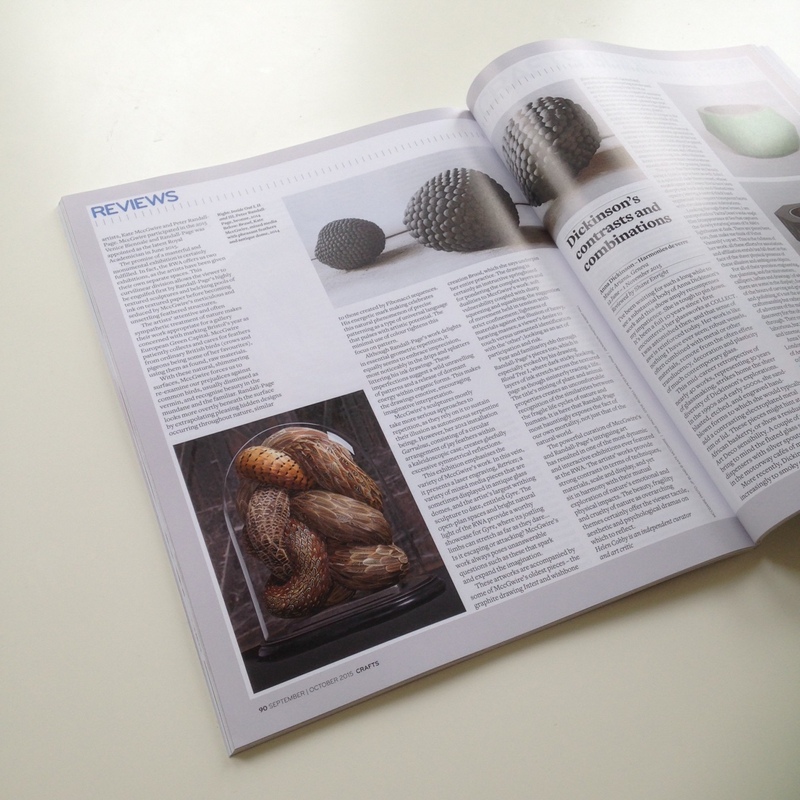 This is now the third time that I have written about Kate MccGwire’s work (please see my interview with Kate on IdeasTap, and my blog post about writing for the Young Arnolfini zine); it is also my third review for ‘Crafts’ magazine. 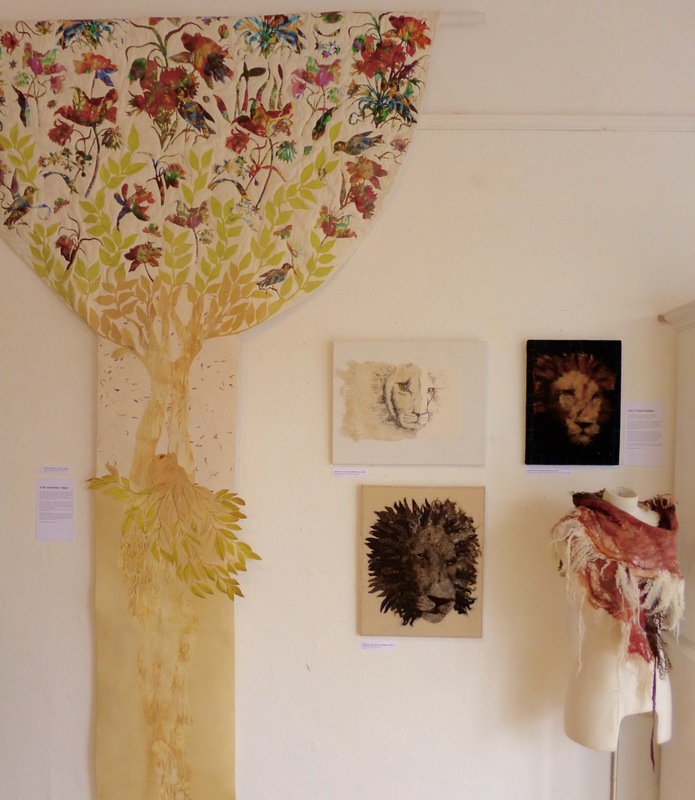 I organised and curated this textiles exhibition at Heart Space Studios, Bristol. 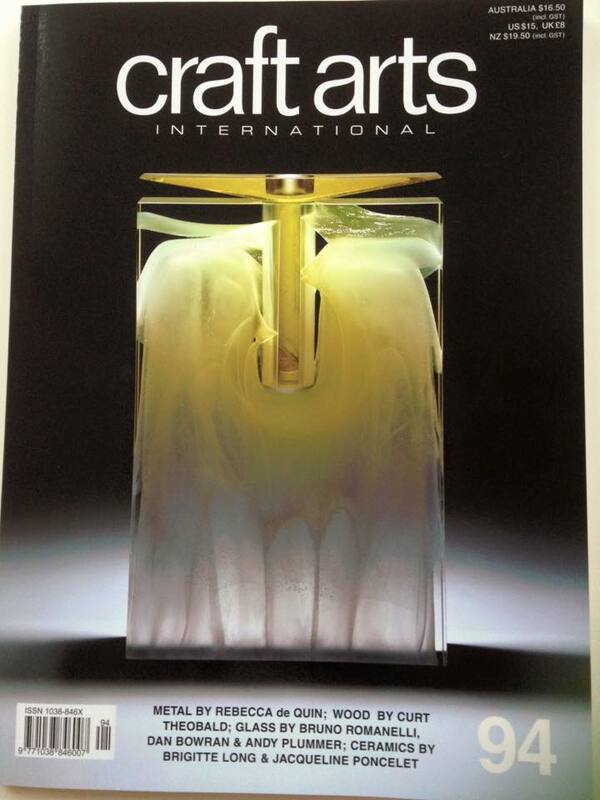 The show opened as part of the Westbury Park Arts Festival in June. 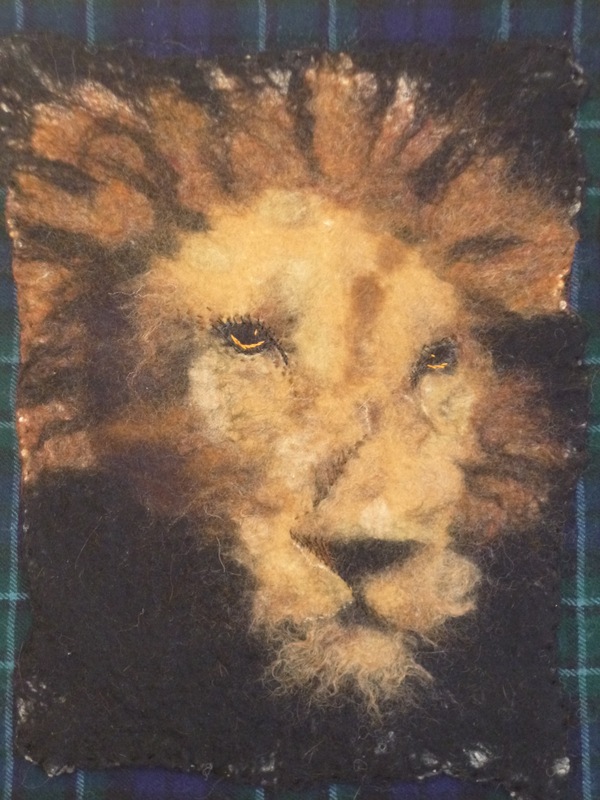 This exhibition presents humorous, contemplative and academic interpretations of ‘Noble Fibres’ in a variety of textile materials by local artists and Heart Space tutors. Each artist’s definition has in common the assumption that Noble Fibres are natural, pure and even raw materials; this encompasses wool, felt and leather. Wool subtly references Shaun the Sheep, who is out and about in Bristol this summer, including on Coldharbour Road. Metals and cottons can also count as Noble Fibres, as they are not just limited to animal-based substances. However, a prominent motif running through this exhibition is the use and behaviour of animals. This is dealt with in a range of ways, from exploring their function as sources for harvesting the Fibres to their threatening interactions with Noble materials (think of the coat-eating clothes moth!). Intriguingly, Nobel Fibres have also been taken to mean regal nobility and luxury, which several artists have explored through the use of historically royal colours and symbols, including the symbolic potential of animals. The textile pieces collectively accentuate the process of making and the notion of ‘noble’ as an honest state of mind and approach to working. Due to this, several of the artworks are experimentations or samples rather than finished products. Sustainable craft also forms part of this code of good practice, which is pertinent considering this is Bristol’s year as European Green Capital. The emphasis on honesty is integral to the ethos of Heart Space Studios, which supports making meaningful things ‘with hand, heart and eye’. 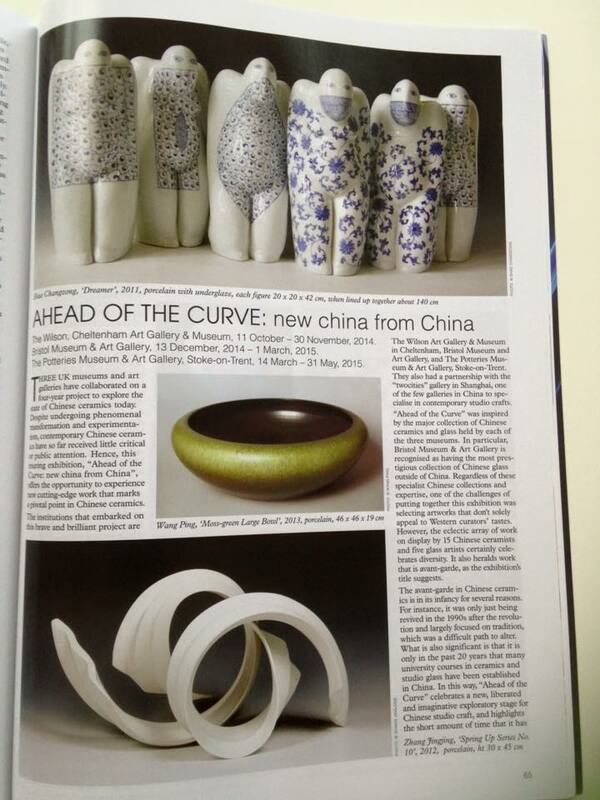 My review of ‘Ahead of the Curve: new china from China’, a touring exhibition on contemporary Chinese ceramics, is published on a four page spread in the latest ‘Craft Arts International’ magazine, issue no. 94. This exhibition started at The Wilson, Cheltenham’s art gallery and museum, in October 2014 and then moved on to Bristol Museum & Art Gallery, before going to The Potteries Museum & Art Gallery in Stoke on Trent. 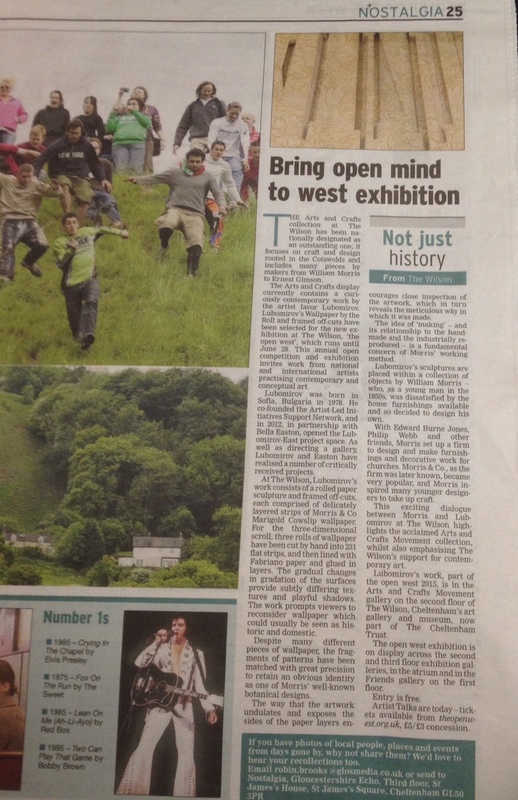 Last week I wrote an article for Gloucestershire’s local newspaper, Echo, on a new contemporary installation by Iavor Lubomirov at The Wilson art gallery and museum in Cheltenham, as part of their contemporary art exhibition ‘the open west’. My article was published on Saturday 23 May. Lubomirov’s artwork, ‘Wallpaper by the Roll’, 2013, is in dialogue with William Morris’s own art and ethos for living. It consists of a rolled paper sculpture and framed off-cuts, each comprised of delicately layered strips of Morris & Co Marigold Cowslip Wallpaper. This is historic and domesticized wallpaper that has been made tactile and dynamic. Henri Matisse, ‘Harmony in Red’, 1908. Oil on canvas, 180 x 220 cm. Matisse collected textiles throughout his life and had generations of weavers in his family. He wanted his work to be decorative and for it to redefine the ‘decorative’ as a positive phenomenon. Painting women and their domestic interiors in a radical way provided him with just the opportunity to explore and expound this. Surprisingly, loose blue textile-inspired patterns dominate Matisse’s rich painting despite it being called Harmony in Red. They are expressive and organic, mirroring the rising shapes of the fruit bowl and its pot plant. It is as though they are growing out of the floor and claiming the table and walls. These patterns are wild and joyful, suggestive of potential creativity and spirit within the house. The trees framed to the left of the painting appear contained and groomed in comparison. Despite the overall emphasis on pattern, the woman’s clothes are intriguingly plain. Her blue top compliments but in no way detracts from the blue designs. The angle of her bent head and stooped body leads the eye away from her and towards the patterns at the painting’s centre. She is very much a part of the still life and does not demand a stronger presence. Could she be a maid, or a careful mistress of the house? In tension with the interior’s patterned promise of creativity, this subdued image of the woman could suggest that her housework – almost literally – consumes her. On the other hand, this blue harmony between her and her surroundings suggests she is at one with her home. In this way, Matisse is keen for us to see that decorative art can have a story and a weight to it. Like all genres of great artistic masterpieces, it shows you a tale just as much as it keeps you asking questions. Matisse has been clever with this painting. It is heavily ornamented and yet not detailed, so verges towards the abstract. The table merges with the wall, the fruit seem like an extension of the random patterning and the chair is definitely missing a leg. Is it a window or a painting that occupies the left-hand side of the wall? The overall flatness and diminished perspective makes this a difficult question to answer. Pattern, colour and line come first. The decorative is given a mind of its own; it is not about conforming, but about creativity, expression and the joy in pure colour and design. And let us not forget, the painting cries, that women have a positive – if often overlooked – place within the decorative and textiles businesses. I organised and curated the exhibition, Spring Love, at Heart Space Studios. 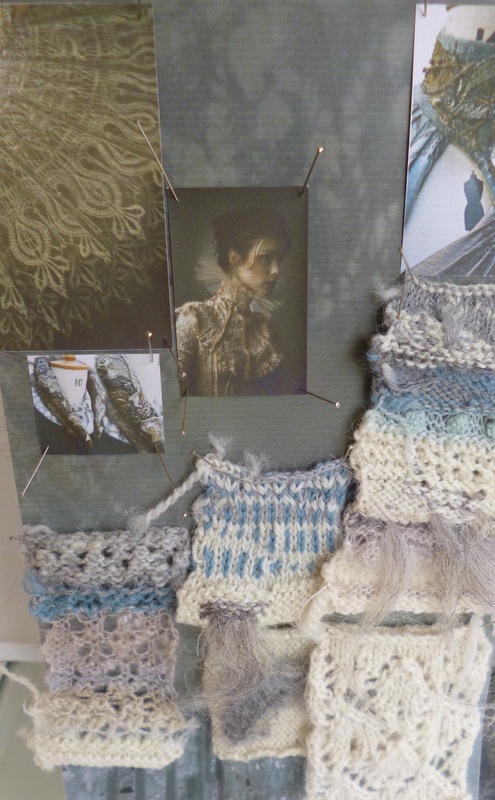 My thoughts about the themes of the exhibition and individual textiles on display are published in a Trebuchet Magazine article and posted below. 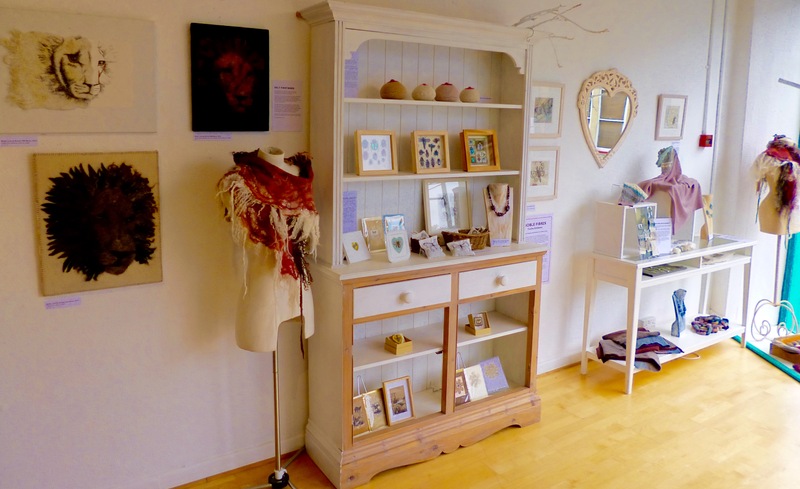 Heart Space Studios is a lively and unusual gem in North Bristol with a variety of textiles classes on offer. Peyote stitch beaded jewellery, pincushion hearts and beautiful paper cut pictures are held alongside weekend corset-making classes. 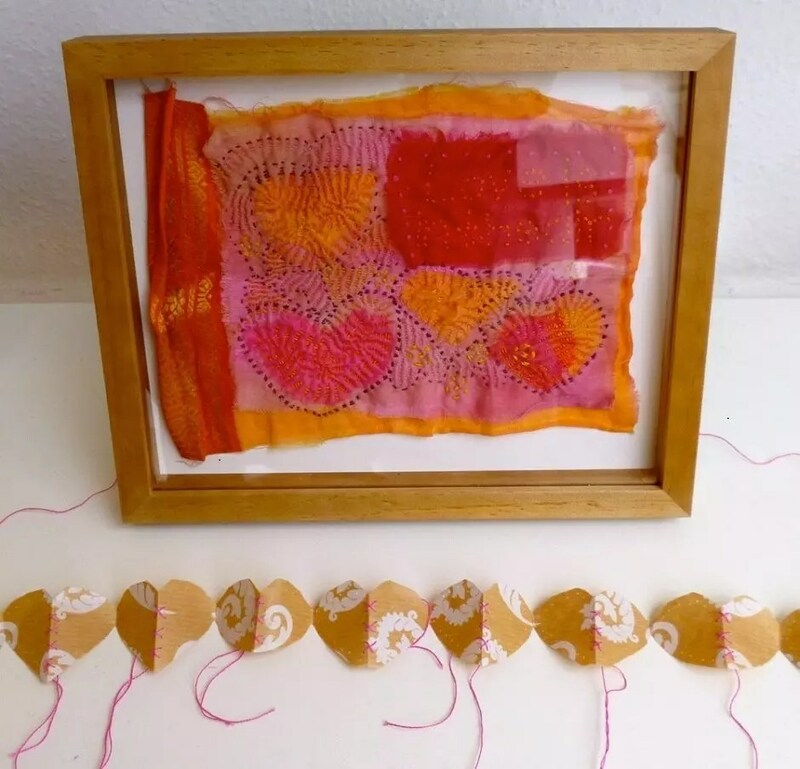 Artists from Bristol and Bath lead these workshops and collaborate with the Studios on a variety of events or regular textile clubs, including a popular ‘Knit & Stitch’ club. Janet Haigh, the founder of the Studios, is an ex-Senior Research Fellow at UWE, Bristol, and was involved with developing textile techniques for vitreous enamel and other materials. She has also written various books on crazy patchwork and embroidery design, and likes to concentrate on drawing and stitching by hand. As a consequence the workshops are detailed and thorough, with a focus on good design. This article is published on The Ken Stradling Collection blog. The automata on display have very different subject matters, but each exudes a great sense of fun. They are both by Peter Markey. One is entitled ‘Kissing Couple’. We have not been able to find the title for the bold, beautiful runners. ‘Kissing Couple’, which is damaged and missing the base, dates from around 1999 and was probably bought from the Cabaret Mechanical Theatre in Covent Garden for whom it was made. This highly unusual shop sells unique handmade automata, as well as kites, card cut-outs and videos. Their permanent exhibition space in Coven Garden sadly dissolved in 2000, but part of their collection is currently in an exhibition at the American Visionary Arts Museum in Baltimore. Colin and Jennifer had a third automaton, called ‘The Rare Appearance of the Lesser Spotted Markey Bird’. They left this to The Ken Stradling Collection too. It is not currently on display because it is broken and waiting to be fixed. Automata date back to the eighteenth century and are closely aligned to the mechanisms of clockwork. It was not uncommon for them to be life size. One of the most famous automata in this period was made by Vaucanson in France and was called ‘The Defecating Duck’. 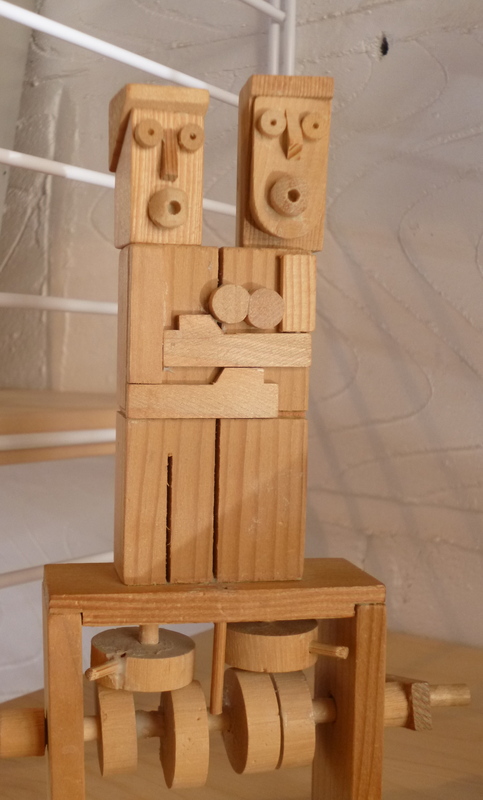 Many of Vaucanson’s automata were made with scientific and educational uses in mind. For example, his ‘Flute Player’ simulated a human being’s actions of playing a flute in order to reveal natural characteristics needed to control this instrument. In this way, these automata were designed to simulate human actions and to show a process that revealed itself over time. By the mid nineteenth century, automata were often ‘quotations’ of the latest technology – for example, pistons and pullcords as opposed to clockwork – and were frequently associated with mass aesthetic entertainment. So their values and functions significantly changed; many were made with the aim of performing circus tricks and took the forms of clowns or animals. 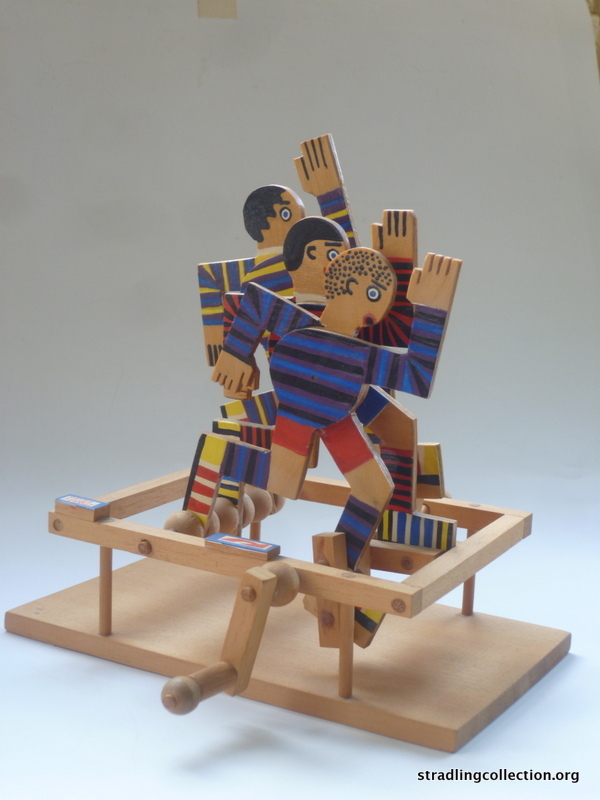 ‘The Beales Bequest’ exhibition is open to view on Wednesdays 10am – 4pm at The Ken Stradling Collection until 11 March. Sam Smith, Fishing Boat ‘S71’, wood with enamelling and mixed media, 1971, 20cm long. And Smith’s book ‘The Secret Harbour’, Ernest Benn Limited, London and Tonbridge, 1975. 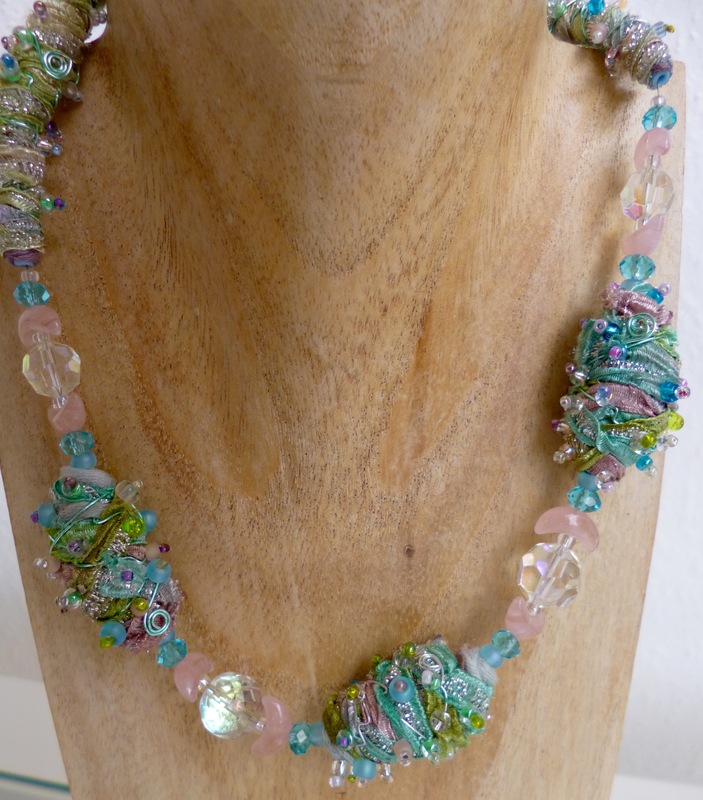 This piece is published on The Ken Stradling Collection blog. 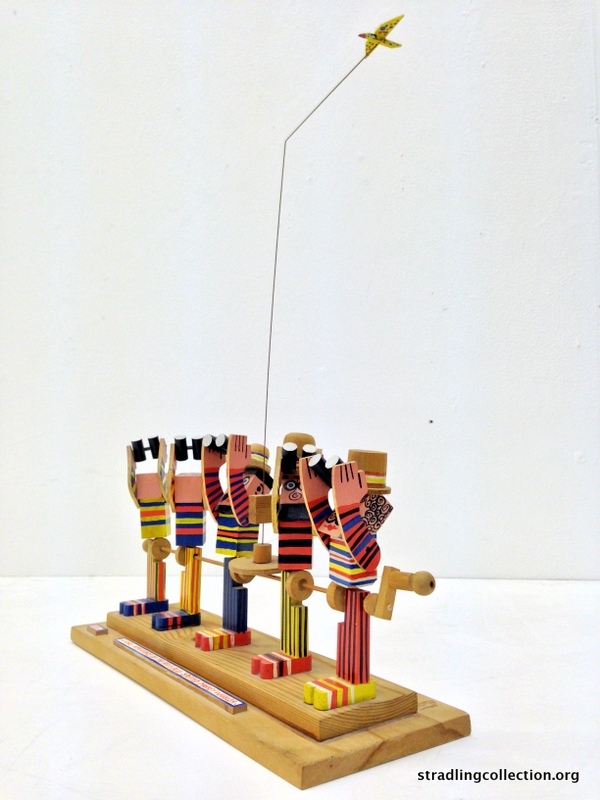 There are many playful, colourful and humorous items on display in The Beales Bequest exhibition. This includes the pieces by Sam Smith. 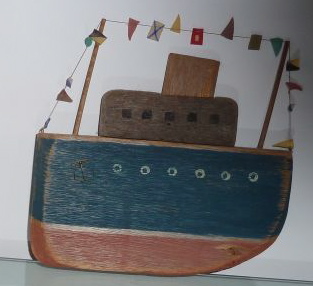 There is one of his fishing boats from the 1970s, made of wood and enamel-painted. 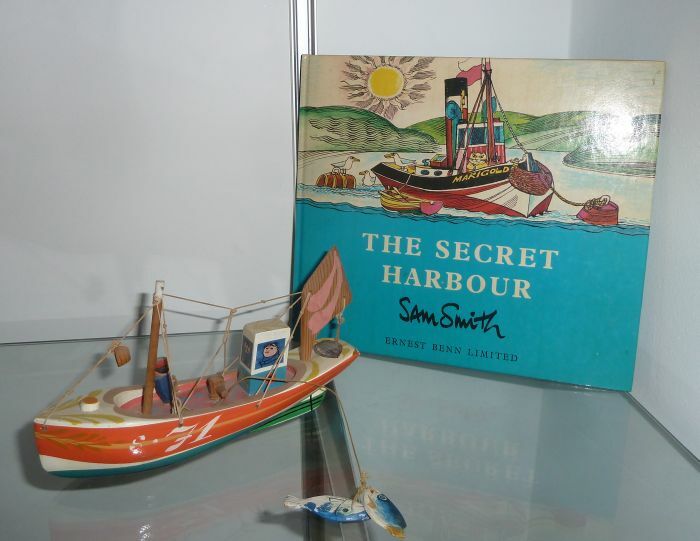 Accompanying this is Smith’s book, The Secret Harbour, from 1975. Sam Smith spent his childhood at the seaside town of Southampton. A painting of his was accepted into an exhibition at the Royal Academy when he was just 17 years old, but he became best known for his hand-carved painted wooden toys and sculpture. He was always drawn to performance and the theatrical in everyday life, which helped him to create an array of colourful characters that kept being repeated in his work. His wooden fishing boats are both sculptures and toys for adults. Their designs started simply and became more complex and individual, with unusual characters that seem to offer stories and social insights. Nautical themes and story telling are repeated throughout The Beales Bequest exhibition. 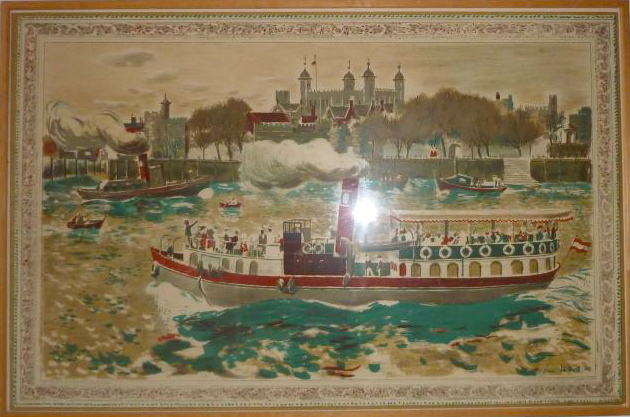 Colin and Jennifer Beales also bequest their 2D wooden boat, with painting and mixed media, made by Victor Stuart Graham. Graham had a varied training in art. He originally trained as a graphic designer followed by a postgraduate degree in textile design. His boats made of worn driftwood have been hugely popular and have been exhibited throughout the UK. Additionally, the print entitled The Tower of London from the School Prints series, by Edwin La Dell 1947, is part of The Beales Bequest to The Ken Stradling Collection. La Dell was appointed as an official war artist during the Second World War. The Beales Bequest will be open to view every Wednesday 10 – 4pm and by appointment until 11th March. Harry Bertoia, an Italian-American sculptor, university lecturer and furniture designer, created The Diamond Chair in 1952 for the firm Knoll International. It comprises of a series containing a small and large version of the chair, a chair with an raised back and a footstall, a child’s chair and a bar chair. The Knoll website refers to them as the ‘wire collection’, and this post illustrates the classic Diamond Chair, The Bird Chair and The Side Chair from this collection. The chairs are sculptural, sturdy and functional; they are surprisingly comfortable and supportive. Most chairs in the mid twentieth century were made of wood, so it was relatively novel that a chair like Bertoia’s Diamond Chair was made with steel. This technique of using steel was familiar to Bertoia due to his experimental work as a sculptor. The fluid lines of the bent metal are pleasing to the eye and unusual in furniture design. The chairs holds an interesting shape from all sides. Although wide, the spaces between the wires give it a quality of lightness and airiness, so it doesn’t seem to impose upon a space. This makes it an appropriate chair for a small or minimalist room. This is an exhibition celebrating the lives of Colin and Jennifer Beales. It commemorates their shared interests and influences in art and design, particularly in association with The Ken Stradling Collection and The Bristol Guild of Applied Arts. 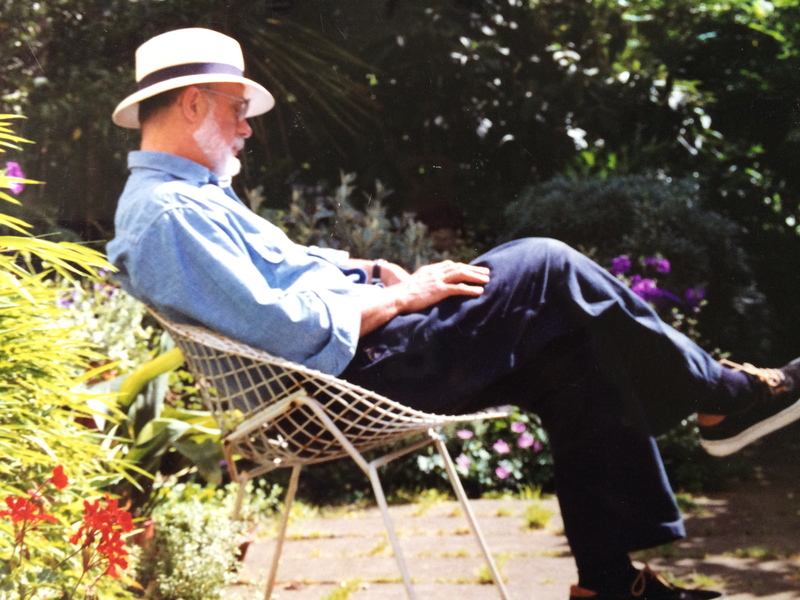 Colin worked as an architect and designer in Bristol from the 1950s, after studying at the RWA School of Architecture. He was initially an architect with the Bristol City Council but later joined the Dickinson Robinson Group and was the architect and interior designer for The Dickinson Robinson Building at 1 Redcliffe Street, Bristol (1963), the city’s first ‘skyscraper’. He had a vast knowledge of 20th century art and design, and was greatly influenced by Modernism. In retirement, Colin became an accomplished potter. 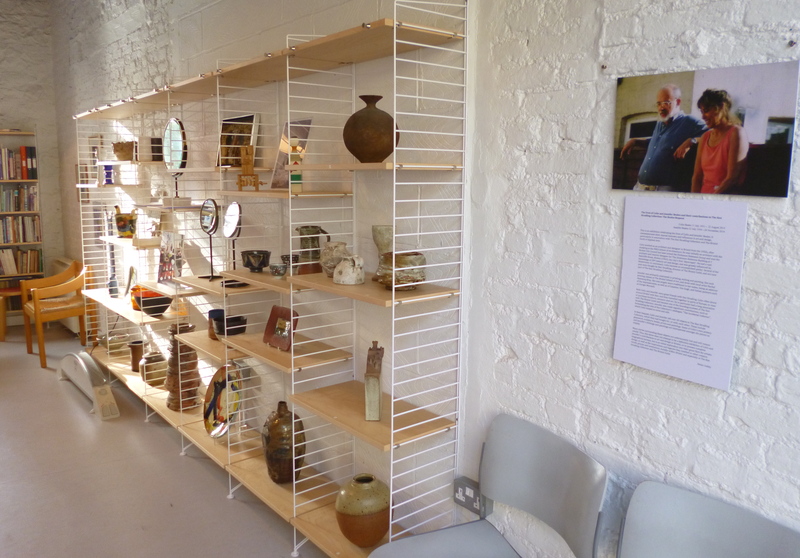 Several of his pots were bought by Ken Stradling, director of The Bristol Guild, and are now part of The Ken Stradling Collection.